Many of today's vehicles simply do not have the interior space available to install a separate DVD player. 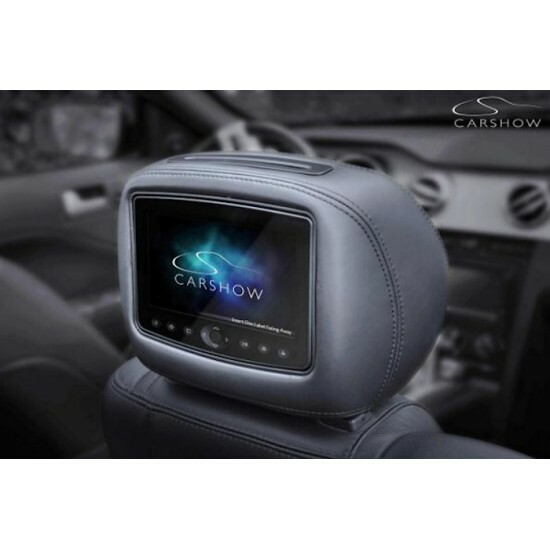 This CARSHOW Headrest Monitor/DVD System provides convenient, top quality mobile entertainment. The CARSHOW 7" Hi Definition (HD) tablet-look LCD LED Backlit DVD Multimedia Headrest System comes ready to install and includes two headrests with monitors, two built-in DVD players (can be played on one or both headrests), all necessary wiring, built-in FM modulator, and two wireless headphones. Headrests match factory interior for color, stitching, and grain patterns of factory OEM headrests. If you cannot find what you are looking for or have a question, then contact us by telephone on 888 711 5908 or by email at our Sales Department. CARSHOW systems are available for Acura, Audi, BMW, Buick, Cadillac, Chevrolet, Chrysler, Dodge, Ford, GMC, Honda, Hyundai, Infiniti, Jeep, Kia, Land Rover, Lexus, Lincoln, Mazda, Mercedes Benz, Nissan, Pontiac, Porsche, Subaru, Toyota, and Volkswagen. Important: Check the CARSHOW Year/Model Guide to see if a system is available for your vehicle, then simply enter either the part # or your vehicle make, model, year and seat/stitching color in the comments box at check out.